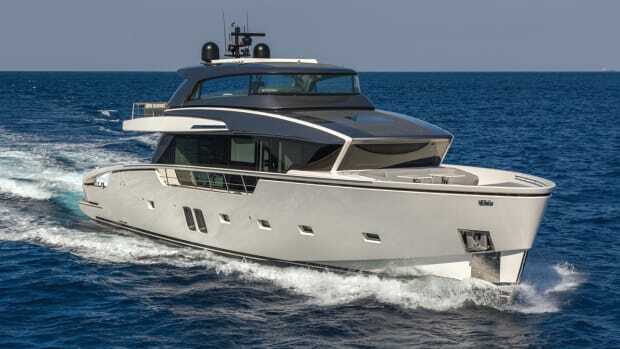 An experienced yacht owner builds the first Horizon E98, helping to shape this new model with her creative ideas for its interior layout and design. Jo Ellard is all smiles as her E98 debuts in Palm Beach. A striking bust of the late Bill Ellard adorns the salon. After a year or so, the couple moved up to a 53-foot sportfisherman, and followed it with a 64-foot convertible. They hired Capt. Glynn Williams to drive that boat 17 years ago, and he has been in their employ ever since. “We also have a horse trainer who has been with us long-term,” said Ellard, who owns prize-winning cutting horses and is a National Cutting Horse Association (NCHA) Hall of Fame Rider with earnings over $700,000. She’s also the youngest person ever inducted into the NCHA Member Hall of Fame. 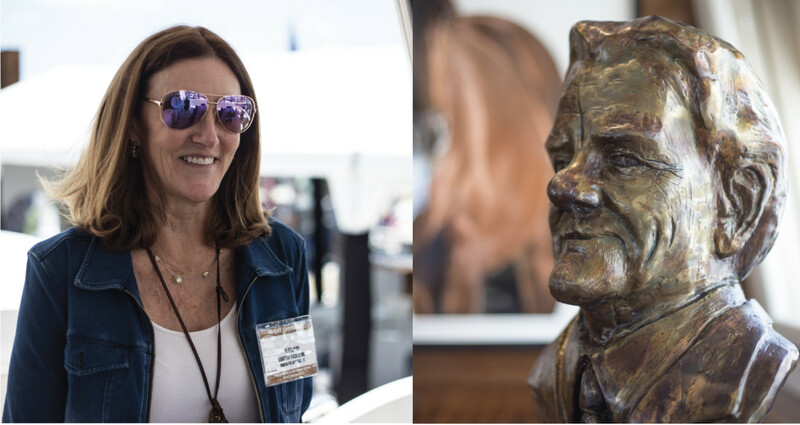 “We’ve been fortunate to have employees who have treated our horses and yachts like they were their own,” she added. 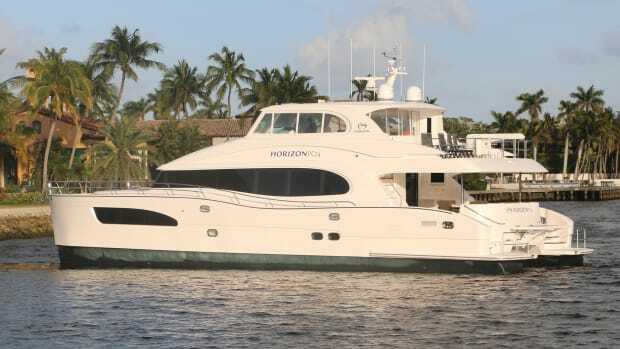 After her husband passed away in 2010, Ellard purchased a pre-owned Horizon 76 on the advice of a yacht broker. 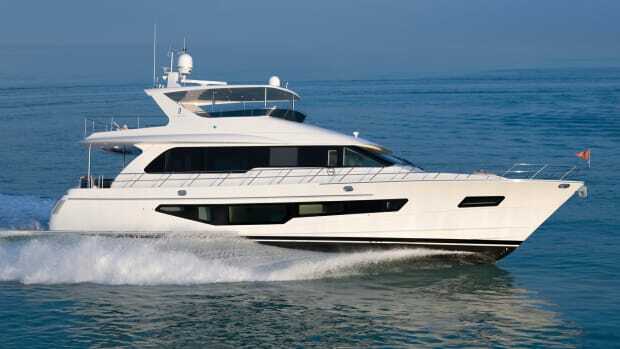 Her requirements for the yacht included an open flybridge and three staterooms, since her two sons frequently join her on cruises. She liked the Horizon, but ultimately decided to build a new one so she could have it exactly the way she wanted it. Ellard decided against a formal dining area, preferring instead to eat with her family in the more comfortable U-shaped seating forward. 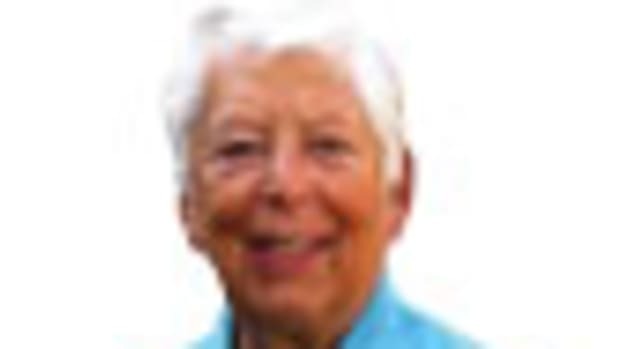 The country kitchen allows her to entertain guests her way. In addition to the extra 10 feet of length, the E98’s 23-foot beam (two feet wider than the E88) adds a wealth of volume inside and out. 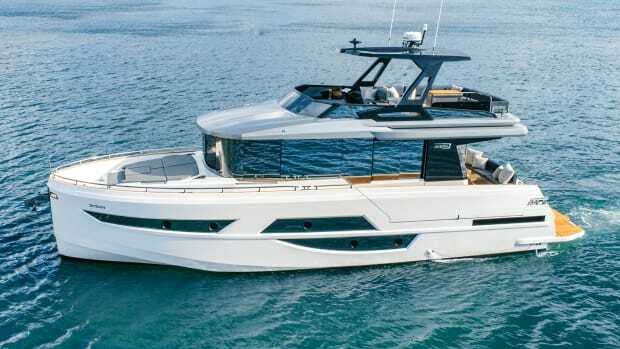 “I think this yacht looks bigger than some that are bigger,” Ellard said at the Palm Beach International Boat Show in March, where the model made its world debut. 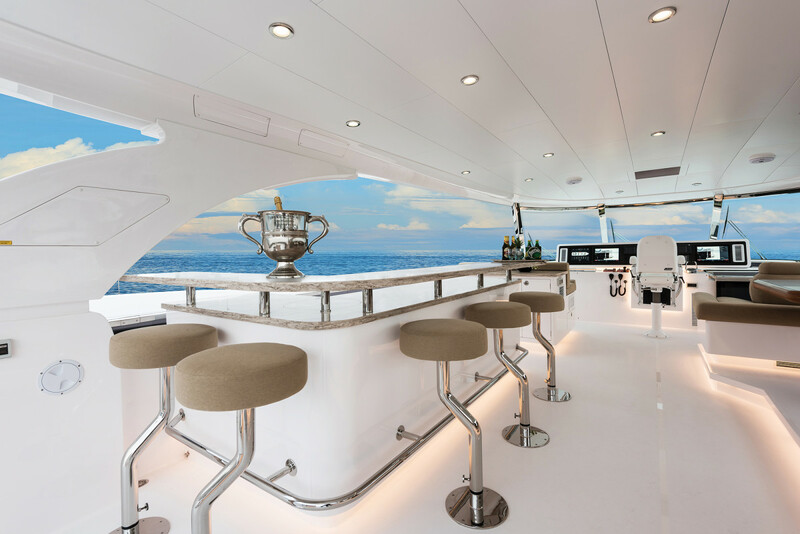 Even on a smaller yacht, the open saloon layout Ellard designed for Do It Now would create an impression of exceptional living space. 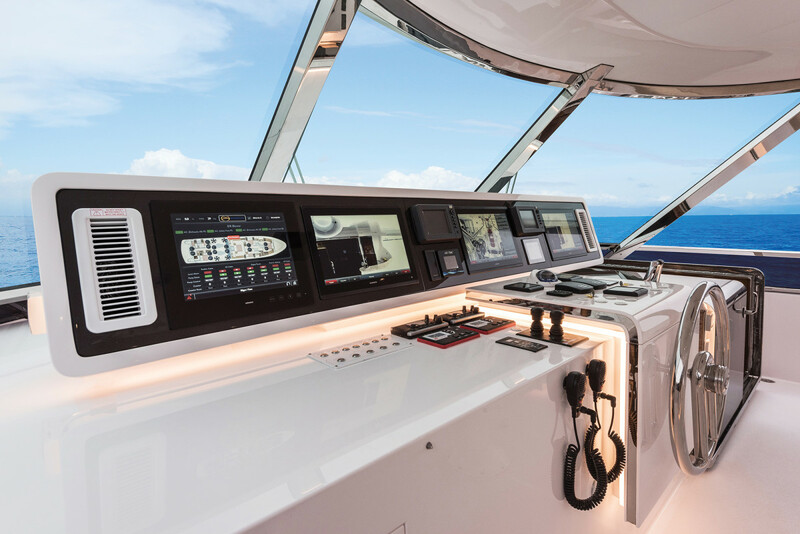 Pass-throughs cut into the bulkheads enclosing the galley provide sweeping sightlines that run all the way from the aft glass sliding doors to the windshield. Ellard eliminated the usual formal dining table and instead, filled the saloon with loose living room furniture that replicates pieces from her homes in Dallas and St. Petersburg, Florida, including two large armchairs and a 14-foot sofa. 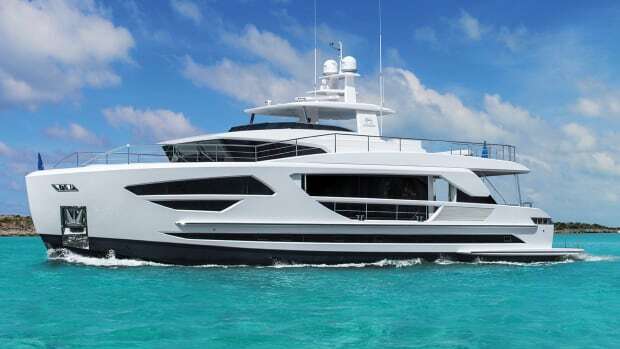 She and her family will dine in Horizon’s hallmark “country kitchen” forward of the galley, or outdoors on the aft deck or flybridge instead of in the salon. In collaboration with Horizon’s in-house design team, Ellard created a rich, classic interior for Do It Now that features African oak flooring and gloss walnut wall panels laid with the grain running horizontally rather than vertically. The joinery has rounded corners to soften the look, but the overall impression is striking. The helm conceals wiring that is labeled and well organized. Ellard’s approach to interior design is highly practical; for example, she moved the main-deck dayhead to the aft corner of the saloon and gave it two doors, one of which opens onto the aft deck behind the bar. She explained why: In other boats she’s been aboard, “If you’re in any type of sea, you have to crawl to the dayhead. Not here.” The dual-access dayhead—a first for Horizon—also helps to preserve air conditioning in the saloon, since guests don’t have to open the sliding glass door every time they need to go inside. Stowage is another practical priority for Ellard, and it is maximized throughout the yacht. The galley has a large pantry and extra freezer drawers, and there is stowage under the large country kitchen dinette seating. “We take two-week trips, and a lot of food storage is important,” she said. 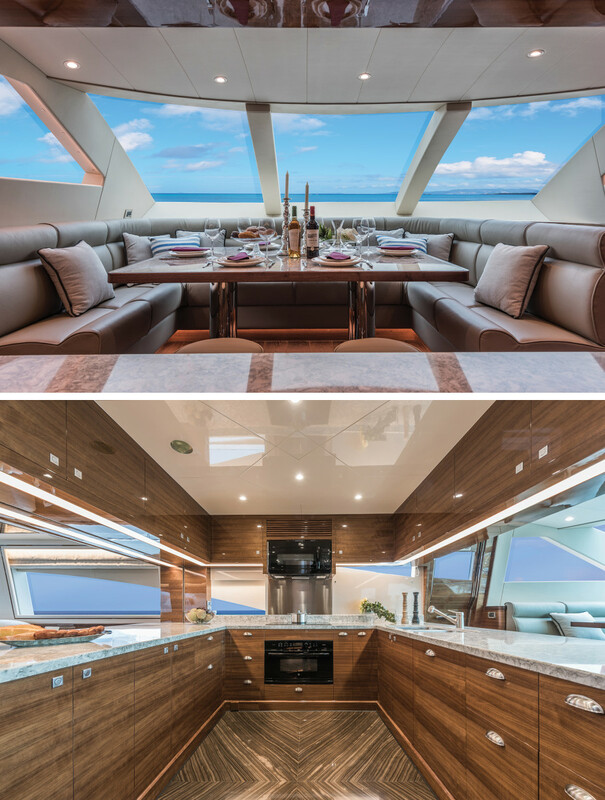 “We like to eat on the boat.” The cabinetry on the lower deck and the flybridge harbors a wealth of stowage as well. Ellard had the stool heights raised on the flybridge to accommodate her tall family. Horizontal-grain walnut wall paneling and joinery—this time with a satin finish—continues on the lower deck in the owner’s and guest accommodations, which are accessed via a stairway from the country kitchen. 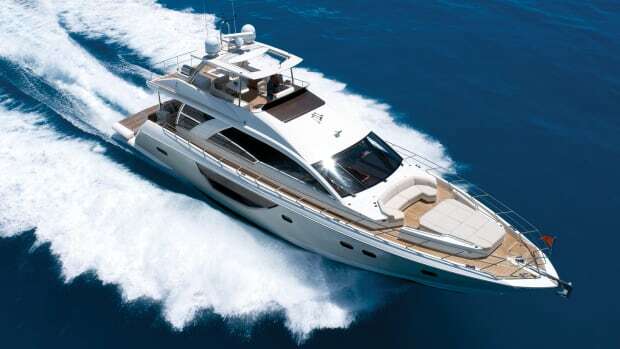 The E98’s beam allows for four generous en suite staterooms. The VIP forward has a walkaround king berth. There are two staterooms amidships; one with a queen berth and the other with twins and a Pullman. While the twin stateroom is available with single berths that can be converted to a queen, Ellard decided against that configuration. “We wanted more storage,” she said. Aft, the full-beam master suite features a California king berth, a walk-in cedar closet and a second hanging locker. The hull windows are similar in design to those on the E88 and incorporate round opening ports. Ellard designed the nail-head trim for the berth’s headboard, and specified that the bed and bureaus be raised. “I just love the look,” she said. The master also has his-and-her heads separated by a generous shower. 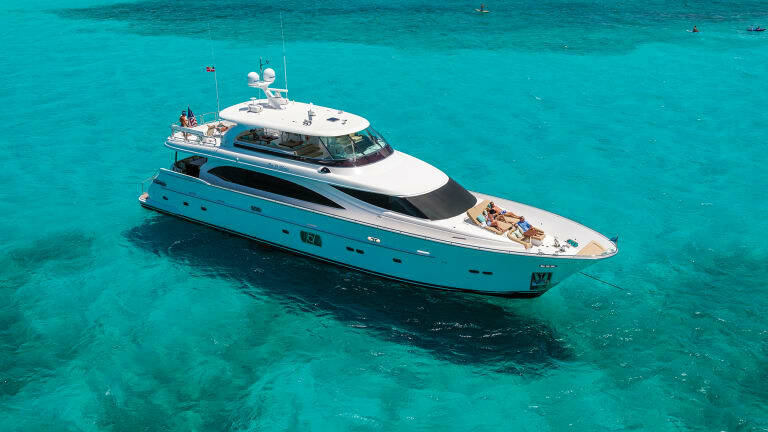 Do It Now’s open flybridge, an Ellard “must,” is beautifully laid out for entertaining or dining with family and friends, facilitated by a bar, fridge, ice maker, sink, and high-low barbecue grill. “We raised the deck and we raised the seating,” Ellard said of the large dining area, which encompasses two tables sheltered by the hardtop. 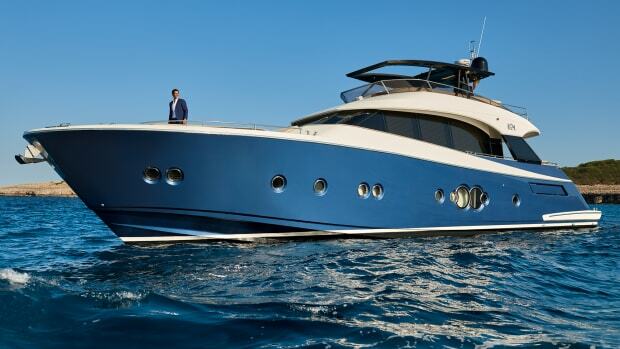 On a previous boat, the flybridge settees were too low, she said. “People couldn’t see. Here, the sightlines are perfect.” The barstools also were customized for her sons’ heights. After Horizon delivered Do It Now to Ellard this winter, she personalized the interior décor with large-format images of her other passion—her prize stallion—by photographer Constance Jaeggi. “I wanted him to be the centerpiece,” she said. In addition, a bronze bust of her husband done by their son Brian holds a place of honor in the salon. 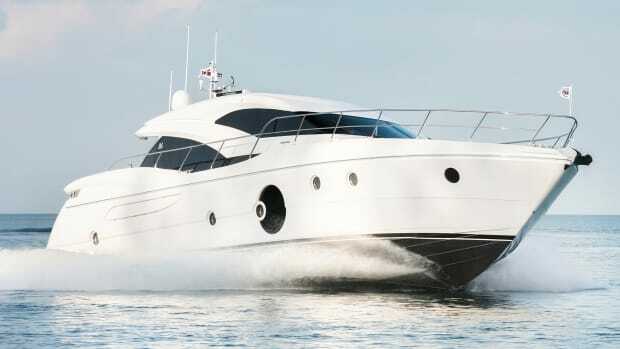 Do It Now, the fourth of the Ellards’ boats to bear the name, which echoes one of Bill Ellard’s motivational company slogans, is a fitting tribute to the late entrepreneur and to his accomplished wife, who seized the day and got exactly what she wanted in the new Horizon E98.